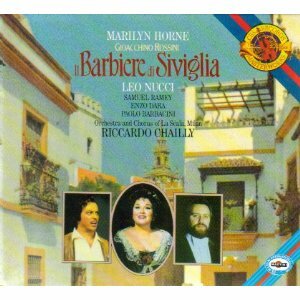 This charming Barbiere is recommended as a first choice by William Berger in his NPR Curious Listener’s Guide to Opera, and understandably so. First of all, it’s one of the only complete Barbieres available: not a single note is cut from either the numbers or the recitatives. 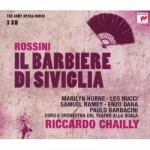 And Riccardo Chailly conducts every note with silky, sparkling elegance and joyous comic relish. The cast is a slightly mixed bag, but still above average, and the sum of the parts creates an excellent whole. Leo Nucci’s Figaro is exceedingly likeable, maneuvering the plot with lithe, chuckling cleverness and a warm milk-chocolate tone. 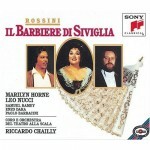 The recording’s chief draw, though, is undoubtedly the virtuoso Rosina of Marilyn Horne. Her robustly creamy sound is hardly girlish and her diction tends to turn mushy during her flights of coloratura, but what magnificent flights of coloratura they are! Nor can I find any fault with her vividly spunky, smiling characterization. Unfortunately alongside two such talented singers, Paolo Barbacini’s Count is only adequate, no less but no more. 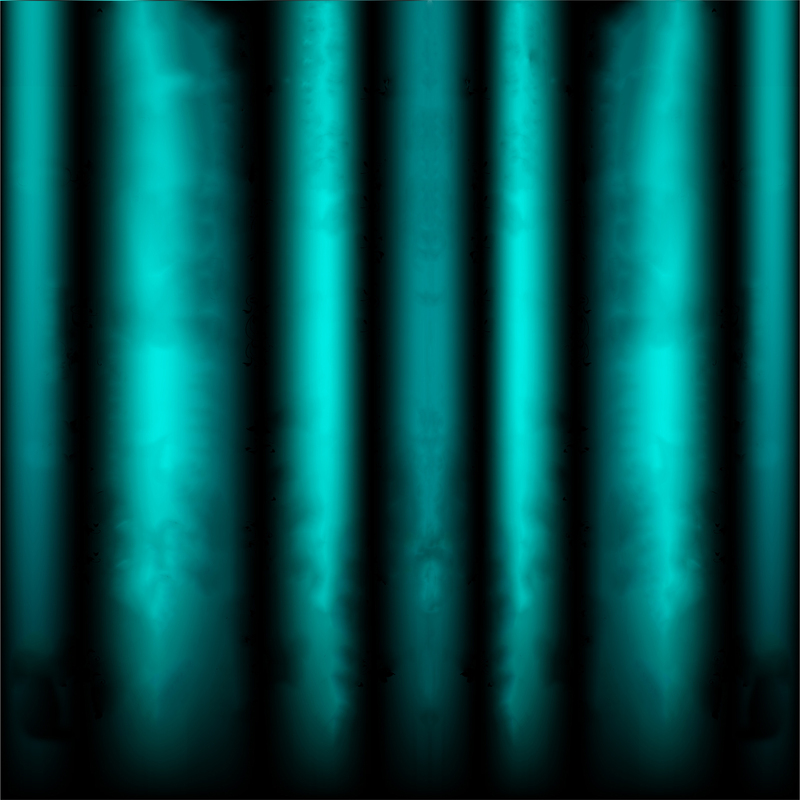 His timbre is bright, strong and effective in ensembles, but lacks sweetness in the upper register, and his coloratura tends to sound clumsy and uncomfortable. It almost makes me regret the inclusion of “Cessa di piú resistere.” As for the two basses, they could hardly be better cast. Enzo Dara, in his second studio recording as Bartolo, seems born for the role with his plush, resonant, bouncing tone, first-rate-patter and flair for humor. 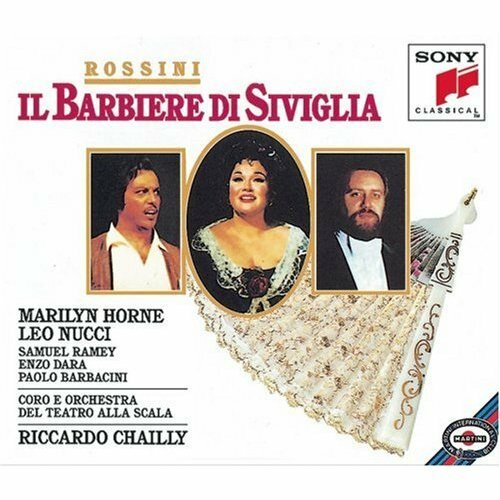 Samuel Ramey, in the first of his own three studio Barbieres, is a luxurious toned, impeccably musical Basilio. How refreshing it is to hear “La calunnia” sung so effortlessly, with no shouting or lumbering, even if it lacks the sheer comic verve that others bring to it. Rounding out the ensemble, Raquel Pierotti sings and sneezes with gusto as Berta. There are too many good Barbieres available for me to call this one definitive, particularly in light of Barbacini’s uneven Almaviva. But still, it would make a fine introduction to the opera and is a must for every Rossini devotee’s collection. It contains a true plethora of talent and is a joy to listen to. A great ‘classic’ choice, but I’m always drawn to the Sills/Levine/EMI set. Much of the cast is past it (inc. Sills, Gedda, Barbieri, and even Milnes), but I always enjoy hearing these seasoned pros having what sounds to be a *great* time.